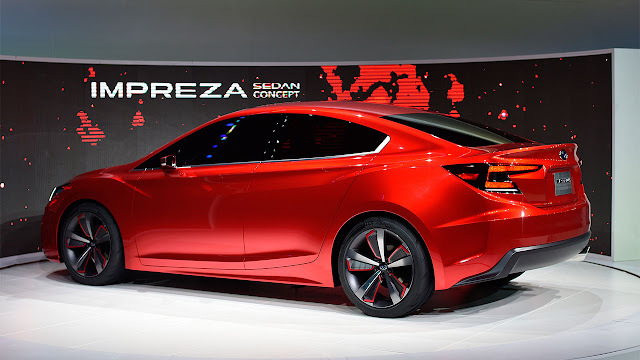 The Impreza Sedan Concept is a design concept car previewing the next-generation Impreza which is to be the first one of Subaru's next-generation strategic vehicles envisioned in FHI's Mid-Term Management Vision "Prominence 2020" announced in May 2014. 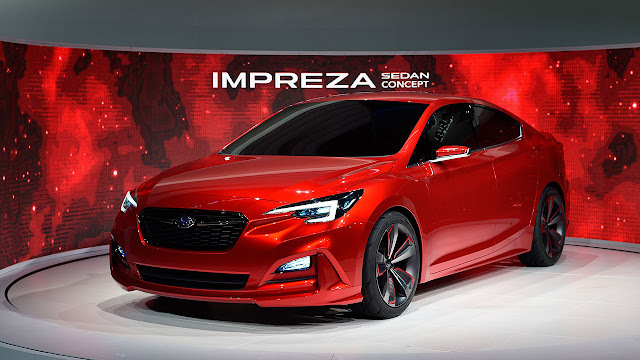 While positioned as an entry model in the Subaru lineup, its compact body features a blend of bold expressions of Subaru's Dynamic & Solid design elements and a quality feel beyond its class - hinting at the design direction not only of the new Impreza but of Subaru's future models as a whole. The front, sides, and rear are seamlessly joined in the Dynamic & Solid surface structure, creating a three-dimensional and solid body that is a feature of Subaru styling. The dynamism is enhanced by well-placed character lines on the compact sedan style. The design expression of "Enjoyment and Peace of Mind", the value that Subaru provides to its customers, is fully pursued within the limits of the C-segment body size. In the area of functionality essential to a Subaru car, excellent aerodynamic performance is achieved while blending this functionality into the styling. The new exterior color "Ruby Red Metallic" has been adopted to express sporty and energetic impression. It is highlighted by glossy-black accents offering high quality-feel. Front: The Subaru look is seen in the Wide & Low stance with its sporty impression, and in the unified three-dimensional structure extending from the hexagonal grille that symbolizes the Subaru identity to the hawk-eye headlights. The front face plays the role of starting point from which the front flows via the sides to the rear, with each part uniting into a solid form. Sides: The rich inflection of the character line extending from the front fender to the door panels and rear shoulder, and the line rising energetically toward the rear from the lower door panel, give dynamism to the solid body surface. The powerfully extended fender flares express the reliability of Subaru All-Wheel Drive.